If you’re a novice race driver looking for some more experience – look no further! Now is your chance to move into the more powerful racing category you’ve dreamed of! You will be driving a 2 Litre, 5 speed manual Ralt RT30/31/32, 0-60 in 4 seconds (YES – 4 SECONDS!) with a possible maximum speed of 160mph! Following a safety briefing you will be driven by one of our professional drivers who will demonstrate the necessary racing lines and techniques required. Then you will drive 10 laps in a sports saloon accompanied by an instructor for full tuition. Then the highlight of your day! 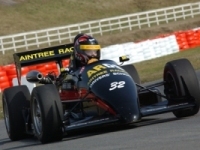 2x 10 lap sessions driving the Formula 3 car! Where’s the podium and champagne??? ?